Logbook entries for the ’03 Buell Blast. 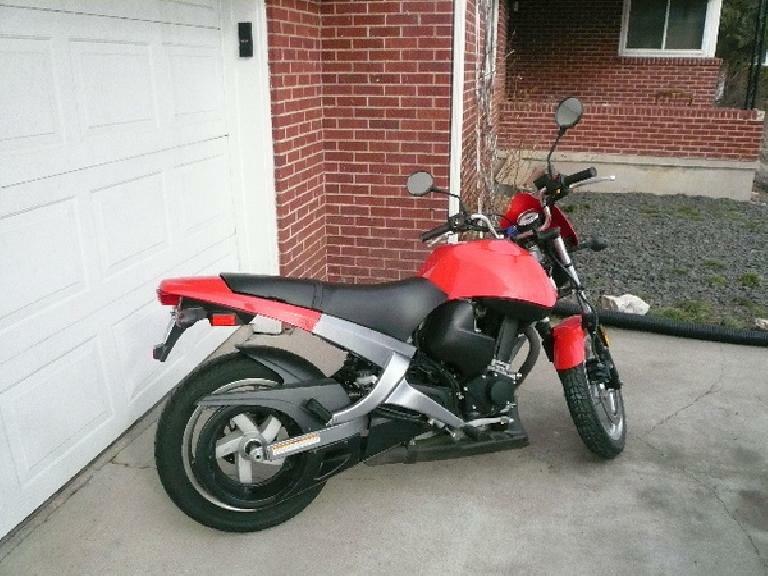 February 3, 2008 (Sun): Put a deposit on the Buell Blast. Mileage: 1,711. February 16, 2008 (Sat): Beth delivers Buell into my garage from Boulder after I replace the spark plug with a new, hotter one (Harley-Davidson #6R12). Mileage: 1,764. April 15, 2008 (Tue): Purchase new left turn signal assembly from Greeley Harley-Davidson, and install a few weeks later. Mileage: ~1,900. April 21, 2009 (Tue): Switched over to synthetic oil (2 quarts Motorex Power Synt 4T 5W-50) and changed filter (Car Quest 85394 = Wix 54394), in preparation for the Colorado-Oklahoma road trip, even though oil change wasn’t necessary until 5k miles. Mileage: 2,521. April 21, 2009 (Tue): Completed 2,500 mile service. See printed Buell Blast service checklist for details. Mileage: 2,521. April 27, 2009 (Mon): In Arnett, TX, discover that the two #10-32 screws holding the fuel shutoff valve had vibrated loose and dropped out. Trevor of Arnett helps me locate and install new ones. Mileage: ~3,800. May 1, 2009 (Fri): Replaced the fuel shutoff screws with two #10-32 X 3/4″ pan-head (Phillips) screws using Teflon tape and lock washers to prevent them from vibrating loose again. Mileage: 4,156. September 3, 2009 (Thu): On the way home from south Fort Collins, bike stalled at Horsetooth/Taft Hill Rd. after riding ~2 miles in dark. Battery was completely dead. Tori came to rescue me and I brought the battery home with me for a battery recharge. Brought battery back to the bike the next morning, installed it, and started right up. Theory: had turned the ignition to the accessories position and left it there for 2 hours, discharging the battery. Mileage: ~4,700. September 17, 2009 (Thu): Replaced handlebars with Bikemaster Superbike chrome handlebars (cut 1.5″ from each end). Used Loctite on all bolts. Also bonded fly shield to rubber stop (located on top of speedometer) with silicone to prevent vibration. Mileage: 4,824. October 7, 2009 Wed: Registered Dunlop original tires in case of recall. October 7, 2009 Wed: Changed engine oil (Mobil 1 10W-40) and filter (Bosch 3311—using this instead of Wix since it is black). Mileage: 5,066. October 8, 2009 Thu: Installed chrome bar-end mirrors (Volar Motorsport Item #M040). Mileage: 5,066. October 8, 2009 Thu: Completed 5,000-mile service: Adjusted clutch, changed primary oil (Mobil 1 20W-50) and adjusted primary chain. Mileage: 5,066. October 9, 2009 Fri: Brought in the rear tire to Sangers Cycle to install new rear tire (OEM, Dunlop K330 120/80-16). $76.99 for tire from Motorcycle Superstore + $34 install at Sangers Cycles. Mileage: 5,066. October 9, 2009 Fri: Painted exhaust with Rustoleum High Heat (1000 deg. F) satin black paint (brush-on). Mileage: 5,066. July 1, 2011 Fri: Changed engine oil (Mobil 1 10W-40) and filter (Bosch 3311). Mileage: 7,545. July 5, 2011 Wed: Completed 7,500-mile service, including primary chain adjustment. (Method: tightened primary chain bolt until it hit chain, then backed off 5 flats.) Mileage: 7,558. May 19, 2012 Sat: Replaced front tire with Pirelli Diablo Scooter 110/70-16 at Sangers Cycles. Also had Sangers replace the front fork seals with an All Balls Racing Fork Seals & Dust Wipers kit I purchased off ebay, since the existing seals on the right fork leg was leaking. The All Balls Racing seals are supposed to have less stiction and last three times longer. Mileage: 8,508. July 5, 2012 Thu: Installed new rear reflector below license plate to replace the one that was lost (stolen?). Mileage: 8,806. July 12, 2012 Sat: Replaced rear tire with Pirelli ST66 140/70-16. Mileage: 8,886. November 29, 2012 Thu: Was going to run errands on the motorcycle, squeezed the clutch lever, and the clutch cable broke. Glad this happened in the garage and not on the road. Mileage: 9,658. March 14, 2013 Thu: Tried installing new clutch cable, but over-torqued threaded cylinder that screws into transmission cover and broke it. Had to order new cable. March 21, 2013 Thu: Installed second new clutch cable. Also changed transmission oil with exactly one quart of Mobil 1 V-Twin 20W-50 synthetic, and engine oil and filter with 1.95 quarts of Mobil 1 Racing 4T 10-40 synthetic and Bosch 3311. Mileage: 9,658. September 1, 2013 Sun: Returned from Europe and noticed a screw was sticking out of the front tire. Plugged hole in front tire using tire repair kit. June 16, 2014 Mon: Installed new battery: AutoCraft 12-Volt Sealed AGM Premium Powersport Battery, 220 CCA. Also repaired right front indicator lens, which was already cracked when I bought the motorcycle, using Crazy Glue. Mileage: 11,224. September 21, 2014 Sun: Eliminated rattle in right mirror by applying silicone adhesive to the rear of mirror glass and tightening the screw (after applying threadlocker) that secures the mirror glass to mirror body. Mileage: 12,006. October 31, 2015 Sat: Started 12,500-mile maintenance. Changed engine oil and filter with 1.95 quarts of Mobil 1 Racing 4T 10-40 synthetic and Bosch 3311. Mileage: 12,642. August 21, 2016 Sun: Finished 12,500-mile maintenance. Front tire very low in tire pressure (lost 12 PSI in 6 hours through tire plug repair); added 4 ounces of Slime to front tire. Added brake fluid (DOT4) to get up to minimum mark. Adjusted primary chain (method: loosen primary securing nut all the way down to bolt, loosen and then tighten bolt until hits chain, back off bolt 5 flats, then tighten securing nut). Tightened clutch cable nut at transmission one flat since there was a small amount of transmission oil there. Replaced spark plug with Champion Copper RA8HC (cross-referenced plug for Harley Davidson 6R12) since did not do so at 10,000 as I was supposed to. Bike started quickly and runs very smooth now. Mileage: 13,076. July 26, 2018 Thu: Replaced front tire with Pirelli Diablo Scooter 110/70-16. Mileage: 13,577. August 24, 2018 Thu: Replaced right front turn signal lens with OEM part Y0039.K. Mileage: 13,764. What oil viscosity did you use for your forks? I’m replacing seals and oil on mine and can’t find a solid reference on equivalent to HD Type E hydraulic oil.